Dee and I were super hungry but very indecisive about what to eat so we decided to check Instagram and we found Papa’s Grill! I had the gizdodo and loved it, Dee had the jollof rice with grilled chicken and loved it, we both had the yam chips with wings and loved it! Of course I tried the jollof rice which had that party firewood feel to it, the yam chips were not overly dried out but still had some crunch to it, the gizdodo was a beautiful mix of perfectly fried dodo #Dodogang and succulent gizzards not those ones that are dried out like driedfish. Wings….delicious, chicken lap…grilled to perfection! Then the sauces, ooh la la….just try each one out and you shall testify. My favorite is honey mustard for now! Ever since, I have been having Papa’s grill deliver to me (fast delivery service)! The meals are perfect for work lunch, Kay and Sek (colleagues) have also joined in on the love because they tried it and loved it! The flyer says it all…. H-Baby and I had to go and sample! I had catfish (=N=4,000 including sides & a bottle of drink/water) and I loved it, H-Baby had croaker fish (=N=3,500 including sides & a bottle of drink/water) and liked it….she would have loved it if it had more spice in it. I thought it was just perfect though plus you get extra spicy sauce to drench the fish in if you want. I am also letting them describe this meal because no way I can do justice to such…. With the quantity and quality of food coupled with the fact that you get bring your own bottle of wine/spirit (whatever drink you have at home actually) then the Fela songs which never cease to burst my head while you sit watching Lagos drive by, 4k definitely leaves my pocket delicious! Mum had this Zobo berry currant iced tea but was too concerned about how small the space is to let me know if she liked it. I tried it though and it was so refreshing, I wish I got myself one but no, I am currently obsessed with milkshakes! I had the oreo milkshake and loved it, Bube had the banana milkshake and loved it so much, it was next to bottom in less than 2mins and I am not even joking! I had about 2 sips from the bottom and I understood why, the banana milkshake is definitely a winner! Mum and Bubs had their dinner combo meal, 8 piece wings (country fried) and jollof rice with fries. The wings had mum sold, she instantly loosened up and even gave me one to try, I helped myself to another one and yes I loved it! (I gave her one of mine too *rolls eyes*). This was my order! As I write this, I can’t stop thinking about the native rice, just try it and you would understand (only for spicy food lovers though!). Mum and H-Baby have also testified to the goodness of this rice so No, it can’t be just my palette that fell in love. Wings were fire too, drenched in delicious honey mustard sauce….. I knew I would be doing more of delivered orders so I decided to try out the turkey wings too but I was honestly too stuffed to fall in love, I know the chipotle bbq sauce was good though. Picked a side of cheese fries because I am trying to get Bube to love cheese, he as usual picked a few and started screaming “I just don’t like cheese”. This guy only likes pounded yam, noodles and lots of meat! I already know that I would be here again in February for a banana milkshake, native rice and wings drenched in a different flavor of sauce because I need to explore them all *laughing at my fat self*! Oooo yes, definitely left mum’s pocket delicious! Now here’s what you need to know, all three places are very casual and the seats aren’t the most luxurious so ladies definitely the kind of places you do not want to wear short clothing and heels to. For me, these are places I can wear jeans, tshirt and no makeup to with 5k in my purse and yet take my tastebuds and tummy on an amazing journey! 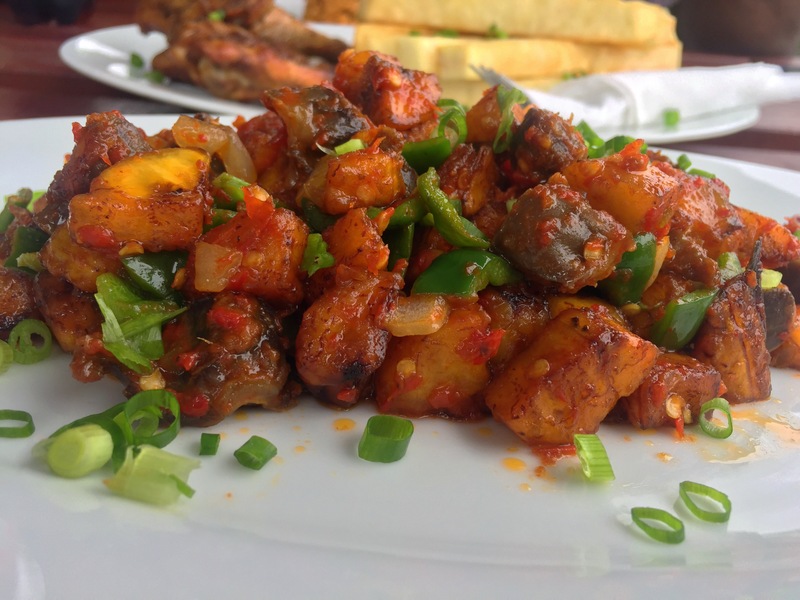 Discovered this Papas Grill a couple of days ago on Instagram, everything I saw looked so yummy… This post has just made me very hungry by the way and mad that I don’t live in Lagos and can’t get to try out all of the yummy food I see here. Thanks for sharing. I’ll defo try at least one on my next visit to Lagos.